An interesting essay by (I believe) Robert Burawoy. I copied the txt here. In 1600, Tokugawa Ieyasu won the battle of Sekigahara and became the master of a unified Japan, thus ending more than a century of continuous civil war, but it is not until the taking of the castle of Ôsaka in 1615 that his grip on the country is firmly secured. The following period of peace will last for an astonishing 250 years. When looking back, we know that peace lasted 250 years, but in the XVIIth century, not only did they not know that, but they could not even imagine such an unheard of situation. So, applying the universal and eternal wisdom si vis pacem para bellum, armour continued to be made as usual. It is only when the last bushi who had actually witnessed a real battle passed away, around 1700, that the idea of lasting peace settled in the minds of the warrior class. Armour always had a dual function: defensive and ceremonial. Defence naturally came first, as there was no ceremonial if you did not survive. With lasting peace though, ceremonial became the primary preoccupation. What concerns us here is the other important consequence of peace: the diminishing demand for armour. Competition among armourers for a share of the shrinking market became fierce. None would go as far as one group, a branch of the Myôchin school who initiated an extraor-dinary disinformation system to establish themselves as the leading armourer family. They were so successful that even to this day the fiction that they created is taken as the most probable history, even when inescapable doubts are expressed. They invented a genealogy going back as far as the IVth century, attributing to their ancestors the authorship of all the famous (and unsigned) historical suits from the medieval period and claimed title of the ancient clan name of « Ki » which had fallen out of use since the VIIIth century. They included in the genealogy every known armourer from the XVIth century who did not sign with a family name. This genealogy was the brainchild of Kunimichi, the first Myôchin to move from Kyôto to the new capital of Edo around 1670, written down in 1680 by his younger brother Munesuke under the title Myôchin rekidai zokufu. Most surprising is the omission in the genealogy of all XVIIth century members of the main branch of the family with the exception of Munenobu, their father. Munesuke’s late born child (he was 73 years old), Munemasa, compiled in the early XVIIIth century a compendium of drawings of armour parts by the family called Meikô zukan, an illustration supplement to his father’s work. Munemasa asked a friend of his father, Matsumiya Kanzan (1686-1780), to write a preface to his « treatise ». Matsumiya, a strategist, scholar and possibly the best armour connoisseur of his time, did so in 1736 remaining in line with the official gospel of the family. Luckily for historical research, this enticed Matsumiya to put together a sequel with the drawings that he made himself during his years of travel in various posts around Japan. The sequel dedicated to the works of the Myôchin family is called Meikô zukan zokushû and there is an appendix dealing with the works of other schools called Meikô zukan fukan. These are not dated but must have been completed almost certainly in 1746. He then worked on an addendum, under the title Dokka kessaku Ryôei zukan, devoted exclusively to the works of Ryôei and Fukushima Kunitaka, which were favoured by the Hôjô school of strategy to which Matsumiya (and Kunitaka) belonged. There are strong indications that this work was not formally completed during his lifetime and was incorporated in the Meikô zukan fukan posthumously. Some 21 partial and 3 complete copies, mostly copies of copies, are recorded today. While Munemasa’s work is mostly theoretical and designed to make pieces fit in his father’s « grand scheme », Matsumiya’s work was drawn after real pieces, carefully examined and annotated with a wealth of technical details, dates and signatures. So why has his work been so com-pletely neglected? The answer is to be found in the Japanese tradition of giving precedence to the titular master (here Munemasa) over outsiders. Discrepancies between the Myôchin « gospel » and history or archaeology are so obvious that if the work of the master, guardian of « family secrets », is so unreliable, how could the work of a stranger be better? Thus, the Meikô zukan has often been used as a source of illustrations but not of information. It is unfortunate that ALL western pub-lications reproduce slavishly the Myôchin fiction, or more precisely Gowland’s Genealogy of the Myôchin family published in the first issue (1892) of the Transactions and Proceedings of the newly founded Japan Society (London). In 1926, in the first modern study Nihon katchû no shin kenkyû, Yamagami Hachirô pointed out that the earliest mention of the name Myôchin in any document was to be found in the Gozuishin sanjô ki dating from 1512, and then only as a horse bit maker. The first Myôchin to sign a helmet was Nobuie in the early 16th century. There is still an on-going debate as to whether there was one, two, three Nobuie, or even none at all, the latter belonging to the conspiracy theory category, which still has some diehard supporters. I will try to demonstrate that there were two generations (this does not take into account some later « provincial » Nobuie). Some of the Myôchin continued to make horse bits well into the XVIIth century. There is a well documented horse bit made on the occasion of the birth of the eldest son of Tokugawa Iemitsu (1639), signed by Muneji, the elder brother of Myôchin Kunimichi (mentioned above). We have now lost the convenient guidance of a comprehensive genealogy of the medieval period. The study of actual pieces shows us though that there were indeed structured groups and relationships between some of them. In order to present these groups in a chart, we shall now have to work our way backwards from the date of completion of the Meikô zukan, i.e. mid XVIIIth century. Since the earliest known signatures date from the end of the XVth century, we will only be able, at best, to go that far back. Even in the XVIIth century, it was not so simple as there were hardly any documents that were not influenced or inspired by the Myôchin themselves. A very important and indisputable document does exist and will supply a wealth of information: the register of deaths of the Kôgenji temple, where the Myôchin have been buried since the early Edo period, which besides the dates, gives the posthumous names and the position (master or not) in the family. It is an invaluable tool to expose dubious inscriptions and dates on pieces made to corroborate the genealogy. Munenobu († 1676), the last of the old masters to use the clan name “Fujiwara”, retired between 1664 and 1669. His eldest son Muneji († 1694) retired in 1657 before his father and therefore did not succeed him. His second son Kunimichi then became head of the family. There is no evidence that he was an able armourer, not a single piece to sustain his fame, not a single signature we can believe in. His reputation as a great forger of Nobuie and Yoshimichi seems to have stemmed from an erroneous interpretation of a single annotated comment in a copy of the Meikô zukan. This has been repeated over and over, but many repetitions do not make a truth. From existing origami we see that Kunimichi († 1707) still used “Fujiwara” in 1669 but then used “Ki” in 1673 ; he retired in 1680 leaving the head of the house to his younger brother Munesuke (1642-1725), a truly great armourer who remained active for quite a long time: 45 years. In 1713, he adopted his pupil Taki Muneakira (1683-1751), the best armourer of the XVIIIth century, to succeed him, but in 1714, at the age of 73, he had a natural son, Munetoyo, who was to be the next head of the family under the name Munemasa (1714-1773). When Munesuke died in 1725, Munemasa was only 11 years old and Muneakira became his tutor until 1729. Here again, there is no evidence that Munemasa ever made armour but he wrote origami as titular head of the family, Muneakira being the « technical » master. When Muneakira died in 1751, Munemasa retired a few years later, in 1757 when he was only 44 years old. This part is devoted to the armourers considered by Matsumiya as being part of the Myôchin school, including those who are now considered to be unrelated. Some caution must be exer-cised as so much of the historical truth has been obscured by the Myôchin themselves. Separa-ting fact from fiction will not be possible on the basis of the study of the Meikô zukan alone, but also of actual pieces and historical data. In its quest for clues, this research has much in common with detective work. Each situation may require different methods in their treatment, direct or indirect, alone or in a team. The number of references available is an important factor. A large number, such as in the case of Nobuie, will allow a statistical treatment which would be meaningless with only a few. There is a general problem with the definition of what constitutes adequate proof and it is necessary to remain aware of the different types of findings: proven, probable, likely (till proven otherwise) or merely possible (but insufficiently supported). One must generally be very careful in cross-examining sources in order to weed out the legendary, the misleading and the mistaken, as well as copy mistakes from one manuscript to another, but when dealing with famous artists we have another problem to worry about: fakes. At the same time we also have to be careful not to be blinded by the fear of fakes and keep in mind that this concept has different undertones in different cultures. However, in the field of armour, technical proficiency is so difficult to achieve that a good starting point is to ponder on who was able to make a credible copy of such or such master and when. We are helped by the fact that in the Edo period documentation was much less abundant and available than today and copyists often made technical or stylistic mistakes. Also, it is much more difficult to simu-late age in steel than it may seem, and Matsumiya’s point of view, much closer to the period of making of the potential fakes, gives all the more weight to his statements. Quite naturally, the study will start with Nobuie, the most debated about armourer. He has left us with a wealth of signed and dated pieces (and a large number of fakes) but a dearth of historical documents. The Meikô zukan zokushû contains an important and precious section on Nobuie and will indirectly provide one of the most important clues to prove his existence and a working date. A chronological list of all found examples of the “kaô” Nobuie signatures with the above mentioned technical details (some can be seen only from the inside of the helmet) show a clear separation in two groups: a first generation that ceased working in 1537, and a second genera-tion who would have signed from 1532 to at least 1545. The two groups are quite homogene-ously distinct in characteristics such as the chiselling of some of the kanji in their signatures and the kaô. All Nobuie I helmets are built from front to back, assembled with five rows of rivets. Most helmets of Nobuie II, except early transition pieces, are built from back to front, with six or seven rows of rivets. Nobuie I only made 62 plate bowls, all 32 plate helmets bear the signature of Nobuie II. An argument for the “fake theory” is that there are so many signatures by Nobuie I and so few by his pupils. This does not take into account the way a workshop functioned. Nobuie I must have had a large workshop with several pupils. He must have signed the pieces even if he did not do everything. It is only when a pupil parted or was allowed to become independent that he would sign his own work. The earliest dated signature by a pupil is 1529, close to the retirement of Nobuie. There are a few (three to this day) early ko-boshi pieces signed with “saku” instead of a kaô. Believed by some to be a different person, by others to be all fakes, they are so few and of such excellent make that in my opinion they are early works of Nobuie I. Among the pupils of Nobuie, Fusamune is by far the best, on a par with Nobuie I. He made only 62 plate helmets, similar in construction and style to those of Nobuie, with dates ranging from 1529 to 1540. As his signature never includes “Myôchin” and has no kanji from Nobuie, one can presume that he left without Nobuie’s blessing. With dates ranging from 1520 to 1543, Hisayoshi, Yoshihisa and Munehisa are contempora-ries of Nobuie, but certainly not his pupils. Their work is markedly inferior. On the contrary, the group of Jôshû armourers, despite the fact that they did not sign with Myôchin either, may well have been a branch of the Myôchin as they shared many stylistic and technical features with Nobuie. They made mostly ko-boshi helmets, with dates ranging from 1561 to 1586. Their quality is good but the ko-boshi are quite inferior to Nobuie’s superb early ko-boshi, but this period of continuous battles generated a large demand for cheaper and less fragile helmets. The work of the Sôshû Myôchin group (this time they did sign with “Myôchin”) was from the same period (late Muromachi to Momoyama), but of rather inferior quality, in steel, workman-ship and finish. A typical feature is their occasional use of za-boshi. The Fujiwara no Myôchin were possibly the direct line of Nobuie II. The first, Muneie, signed several horse bits, but only one helmet by him is known, signed only “Muneie saku” and dated from 1578. 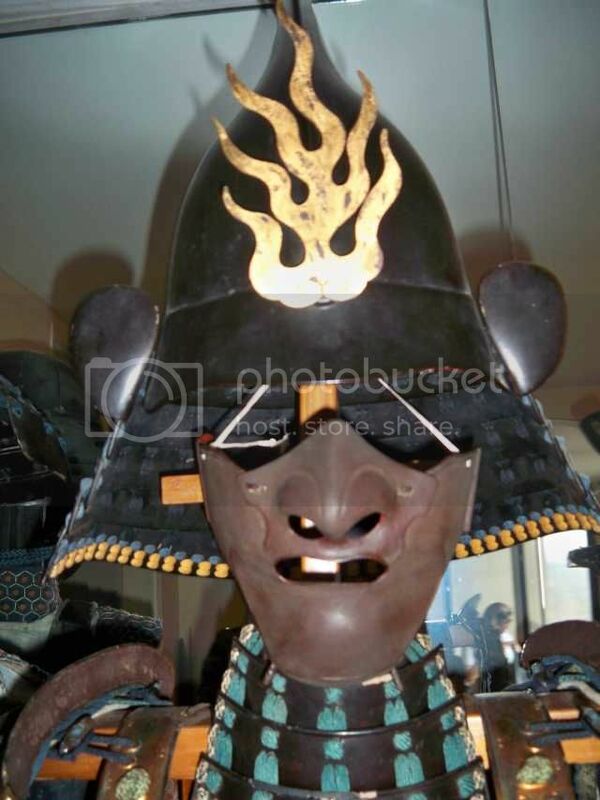 There are very few pieces of armour signed by his son Munenobu and only a horse bit by his elder grandson Muneji. It was Kunimichi, the second grandson, who founded the “Ki no Myôchin” branch mentioned in the first part, and fabricated the legendary genealogy of the Myôchin family; but it was only with Munesuke that real production started in this branch, its most prominent member being Muneakira, a master at embossing known for his spectacular masks. Yoshimichi was certainly the greatest armourer of all times but unfortunately, apart from a number of pieces (and many fakes naturally), remains almost totally undocumented. He signed only “Yoshimichi” with no family name, no date and no place of residence. His technique and style differed substantially from Nobuie and it is certain that he was not related at all to the Myôchin, who incorporated him in their genealogy because of his fame and the absence of con-trary evidence. The only clue as to his date of activity is given by a helmet made by one of his pupils, Katsuyoshi, dated 1543, which enables us to place it around 1520-30. He was the inven-tor of an overlapping wavy plate technique (opposed to the flat plates of Nobuie and all others from the period) which absorbed impacts more efficiently. His most prominent pupil was Takayoshi, very close both in quality and style. He has been considered since the XVIIth century as one of the “three great masters”, along with Yoshimichi and Nobuie. Until recently, the Yukinoshita group has been considered a branch of the Myôchin active in Yukinoshita, a town of Sôshû province (another Myôchin tale). In fact, as it has been demon-strated in Japan, Yukinoshita is their family name and they were in the middle of the XVIth century wrought iron lantern makers in Kurokawa (Aizu province), ruled by the Ashina clan and conquered in 1585 by Date Masamune. The oldest piece known is an iron lantern dated 1551 in the Manganji temple (Aizu province). They later became famous for their solid plate bullet tested cuirasses. There are dates ranging from 1584 to 1607, with the addition of a cuirass by a distant descendant dated 1671. In this part which deals with schools other than those that are related to the Myôchin, we will not have to worry much about dispelling false legends, despite the failed attempt by the Saotome school in the XVIIIth century to emulate the Myôchin formula by inventing for them-selves a genealogy linking them to Myôchin Nobuie. This was meant to restore their fame after being the most prolific helmet makers of the XVIIth century but disappearing from the scene by the second half of the XVIIIth, pushed out by the successful ploy of the Myôchin who managed to become official armourers to the bakufu in 1793. This study will only focus on the schools for which the Meikô zukan supplied new or addi-tional information, such as the Saotome. The Meikô zukan states that the school founder, Saotome Ietada, was a retainer of Tagaya Shuri (Tagaya shuri tayu Shigetsune, lord of Shi-motsuma castle in Hitachi province). This daimyô was dispossessed of his fiefdom for choosing the wrong side at the battle of Sekigahara (1600). Ietada, having become a rônin, turned to armour making. He became the best helmet maker of the XVIIth century, taking the name of Saotome, the village of Hitachi province where he lived. It is quite unlikely that, as stated in the Meikô zukan, he was in any way related to the Myôchin (there are too many differences in style and technique) and no document has yet come to light indicating from whom he learned his trade. However, from the information about his lord, it is clear that the Saotome school cannot have started before the early XVIIth century and that all the Muromachi period datings that we still find in most books today are fictitious. In addition, contemporary research has shown that each name (Ietada, Iesada, Iehisa, Iechika, Ienari) was used by several generations as can be inferred from the different styles of signatures and the rare dates found on helmets. Noguchi Zesai, who is mentioned only on one page of the Meikô zukan fukan with an unusu-ally long text, subsequently disappeared from all later treatises until this research. However, the long text gives several clues, some very obscure in the typical Matsumiya sinicized mannerism which, along with the discovery of the piece illustrated in that page and other suits of armour very similar in style and technical details, enabled me to pull him out of oblivion and, through the study of his rather large body of works (14 to this day), to define the characteristics of his style, his background and date of activity (late XVIIth century). He appears to have been the most inventive and practical minded armour designer of his time and had only suffered the misfortune of arriving too late, in a period where show became more important than defence as explained in the first part. The Hôjô school of strategy was founded in the early XVIIth century by Hôjô Ujinaga and was at the service of the bakufu. Fukushima Denbei was a disciple of Ujinaga who chose him to succeed him as head of the school under the name Kunitaka. Matsumiya Kanzan was the secre-tary of Hôjô Ujisuke (youngest brother of Ujinaga), both disciples of Kunitaka. Ujisuke occupied various official posts around Japan and this gave Matsumiya many opportunities to examine armour in several fiefdoms. Ujisuke’s son and grandson were to be ogusoku bugyô (government commissioner for armour). Kunitaka was also an amateur armourer, and having heard of the fame of a master of repoussé from Hiroshima called Ryôei (Ohara Katsunari was his real name), called him to Edo in the late XVIIth century to be his teacher. In the eyes of Matsumiya, and mine after studying a large number of pieces, Kunitaka surpassed Ryôei. The biography of Ryôei in the Meikô zukan fukan is the sole source of information on this master and the Dokka kessaku Ryôei zukan, post-humously incorporated in the Meikô zukan fukan, is the closest thing to a “catalogue raisonné” of the works of both Ryôei and Kunitaka. Neither of them ever did two identical pieces which helps for their identification (16 pieces have been found to this day). Here you can follow the Myochin genealogy from 640 AD, even though they say they go back to 200 AD. It is from a text regarding japanese artists in many fields. Also a lot of info for those interested in Goto sword mountings and other art forms.